Wildlife such as bear and moose require enormous landscapes to meet their dietary and reproductive needs throughout the year. Until recently most of the conserved land has been away from roads in areas that we might call core habitat. 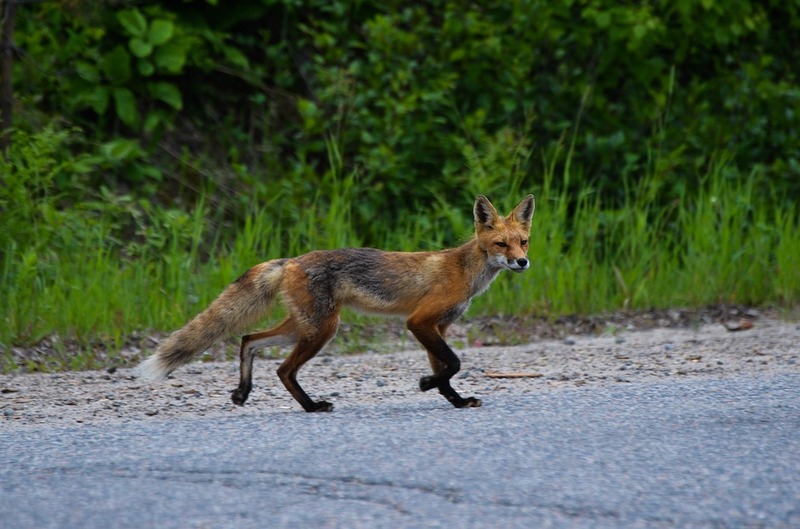 The problem is that wildlife need to cross roads to meet their needs from season to season. So they might be feeding in and around wetlands in the spring, move to their favorite berry patches in the summer and then head off to mast stands of oak and beech in the fall. In the course of this travelling they may cover the equivalent of 150,000 acres. The average town in our area is only 30,000 acres in size. So a well functioning travel network for a bear may include 6 towns and the national forest. This underscores the need to conserve land on both sides of many roads in places that work well for wildlife crossings and will link areas of quality core habitat. Linking small or otherwise isolated habitat patches reduces the risk of local population extinctions by enabling migration, reproduction, and exchange of genes for many plant and animal species. 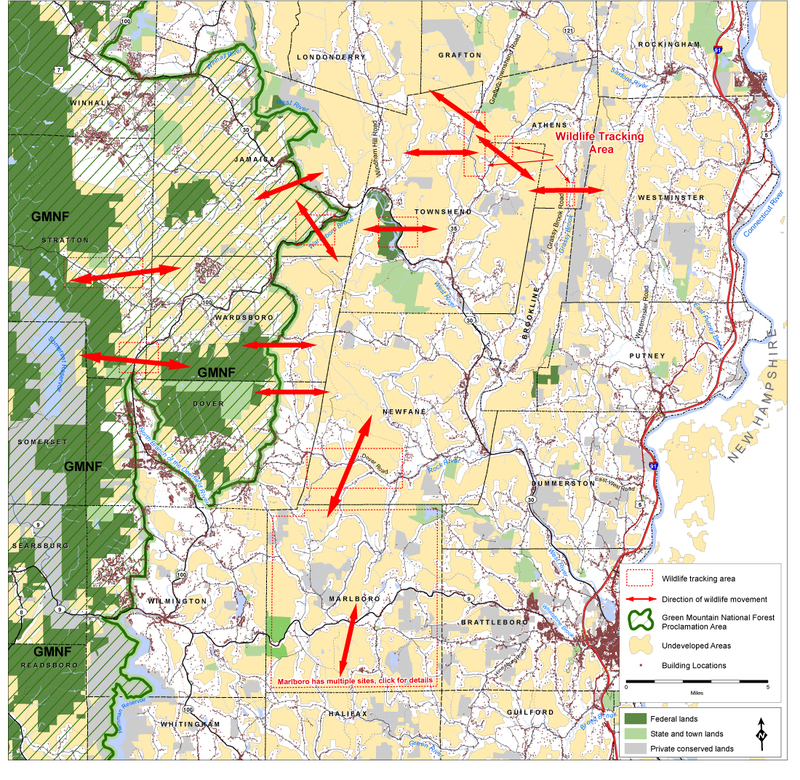 Below is a map showing a number of places around Windham County where The Green Mountain Conservancy has documented wildlife road crossings. You will notice that most of the threatened crossings are on main roads such as routes 9, 30, 35 and route 100. All data on this map was collected while standing on public roadways. The Green Mountain Conservancy is currently limiting its work to conservation of these critical wildlife corridors. It is depending on local conservation commissions and environmental organizations to continue the work of documenting road crossings. If you want to work on documenting the road crossings in your area, contact the Bonnyvale Environmental Education Center at beec@sover.net or contact your town’s conservation commission. 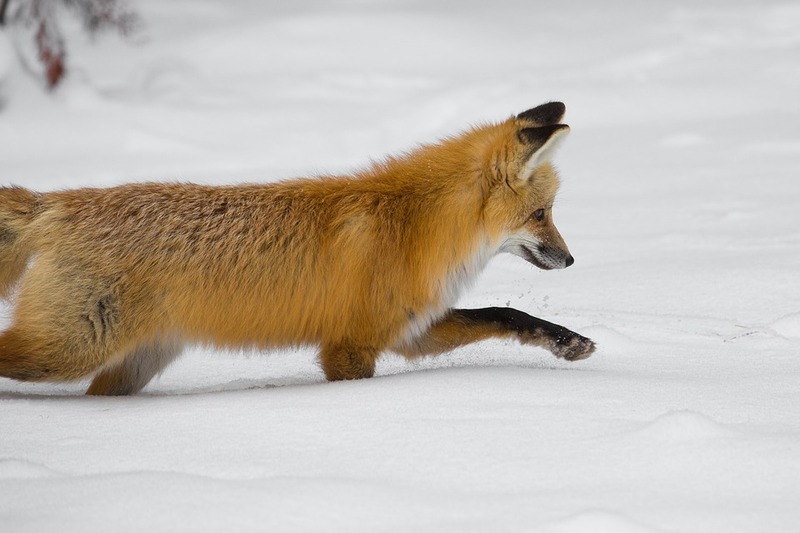 Our thanks to Adam Gebb, initiator of the Wildlife Travel Corridor project, and Nate Harvey, professional tracker of Marlboro Vermont, who worked with the Green Mountain Conservancy on this project.